Gil & I toured the Antelope Valley Indian Museum on March 15, 1998, the day after our camping trip at Saddleback Butte with my sis, Elaine & her (now ex) hubby, Chuck. On our way back home, we split ways with Elaine & Chuck and made a few side trips, including a brief stop at Alpine Butte Wildlife Sanctuary (http://westernsojourns.blogspot.com/2011/12/alpine-butte-wildlife-sanctuary-n-los.html) and another at the Indian Museum. The museum is a truly unique, folk-artsy structure which houses collections of Native American artifacts primarily from California, the Southwest and Great Basin regions. HISTORY: In the 1920s, Howard Arden Edwards, a self-taught artist, fell in love with the scenery while visiting the buttes in the Antelope Valley. He homesteaded 160 acres on Piute Butte and he, his wife and teenage son began constructing their dream home there in 1928, which evolved into a Swiss Chalet-style structure incorporating large granite boulders into the building itself. The boulders are in view as you go from Kachina Hall up to California Hall in the museum. Some years later, Grace Wilcox Oliver, an anthropology student, discovered the home while hiking in the area and eventually bought the property from the Edwards to house her Native American collection. Thus, the Antelope Valley Indian Museum was born. Oliver remodeled and expanded the facilities and operated it for the next 30 years until 1979, when the State of California purchased the museum, with Oliver donating all the artifacts. 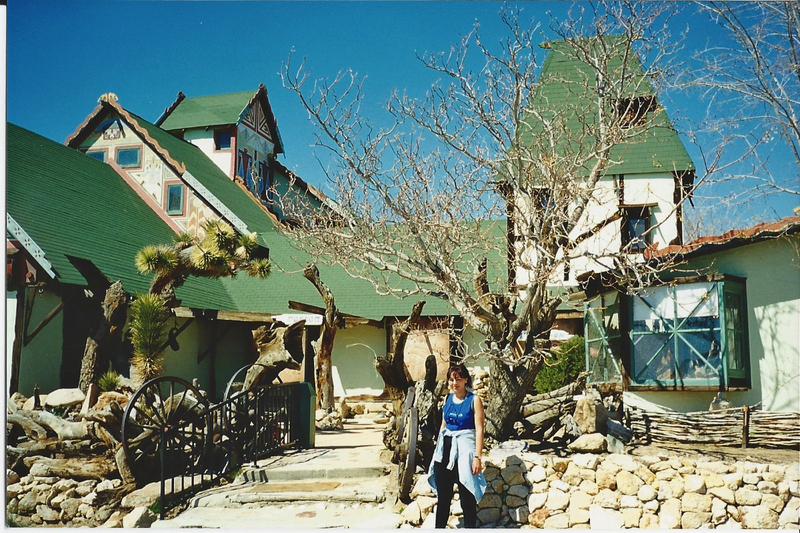 3/15/1998 Me in front of the Antelope Valley Indian Museum. Location: Mojave Desert on Paiute Butte. County/State: NE Los Angeles County, CA. Directions: 17 miles east of Antelope Valley Fwy. (Hwy. 14). On Avenue M between 150th and 170th St. East. Go east of Avenue K (Palmdale Blvd.) and follow signs to museum. Or, exit Pearblossom Hwy. (Hwy. 138) at 165th St. East and head north. Contact Info: 15701 East Avenue M, Lancaster, CA 93535. Tel (661)946-3055. Fees: $3.00 for adults (cash & checks only). Children under 12 free. Hours: Sat - Sun. 11am - 4pm. Group tours on Thursdays with reservation. Wonderful colors and organic natural forms. Reminds me of a painting like Rainy landscape, by Russian painter Kandinsky, http://EN.WahooArt.com/A55A04/w.nsf/OPRA/BRUE-8EWL66, that I saw at wahooart.com, from where one can order a canvas print of it. Really good place to browse the painter’s work and other work similar to your style of painting.